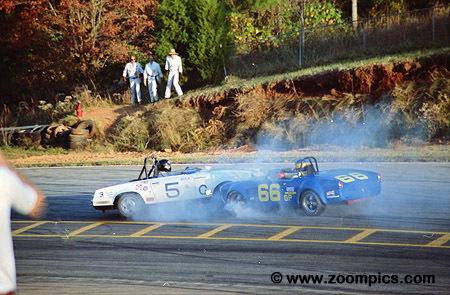 Twenty-one classes competed at Road Atlanta for the Sports Car Club of America's National Championships. 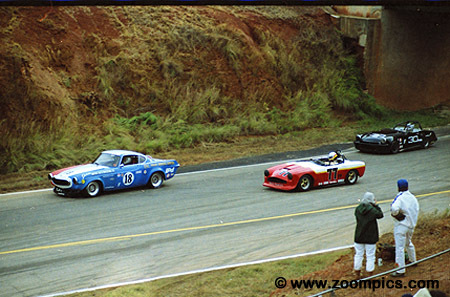 The Runoffs as the event is commonly called had had an entry of over 500-drivers and cars. As usual, there was controversy, close racing and upsets. Rain on Friday, cold temperatures on Saturday and a combination of the two on Sunday affected the outcome of some races. 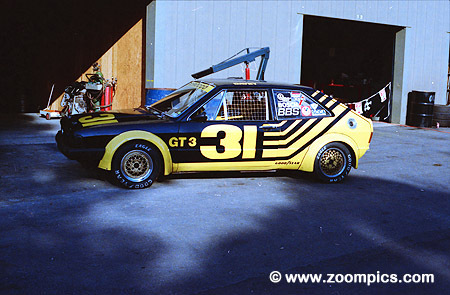 Since 1966 the H Production National Championship had been won by a driver in a British Leyland product – Austin Healy Sprite or MG Midget – but that changed in 1981. Anatoly Arutunoff driving a 1966 Morgan qualified about 4-seconds off the pole in the dry qualifying session. Race day saw wet conditions which Arutunoff used to his advantage to secure the H Production National Championship. 1981 was the first of two Runoffs for Michael Andretti. He finished eighth in Formula Ford driving a Van Diemen RF81. In 1982, he did much better qualifying on the Formula Ford pole in a Lola T 640 and finished third. Just three years later he would complete in the CART Indy Car series and win the championship in 1991. 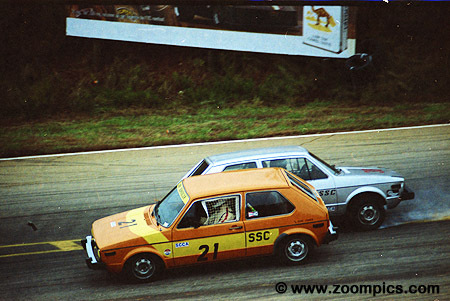 The first race of the 1981 Runoffs was A Sports Racing. 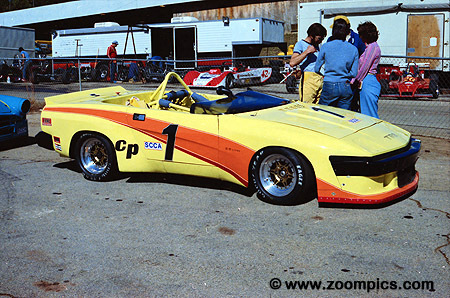 Leading from start to finish was Jerry Hansen in a Lola T-332. This was Hansen’s seventh consecutive A Sports Racing Championship and his twenty-third National title. 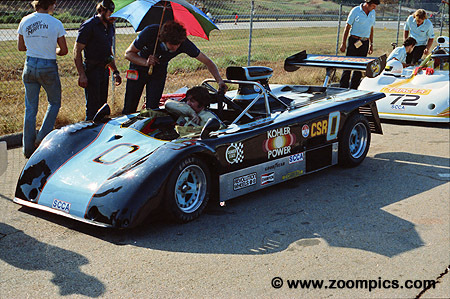 Completing the podium - was second place Bob Allen in an SSE and Tom Foster driving a Lola T-296. During G Production qualifying the No. 5 Datsun driven by David Hansen spun at turn-11. Mark Taylor in an Alfa Romeo Spyder was unable to avoid contact. Fortunately, neither car was seriously damaged and they both started the race. 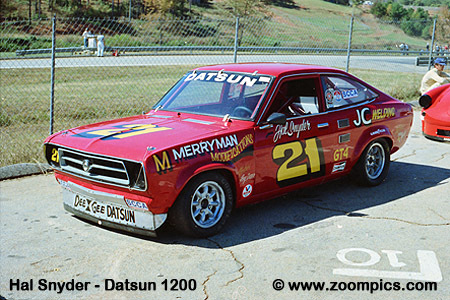 Hansen in the Datsun 311 SPL finished eighteenth while Taylor was classified as eleventh. 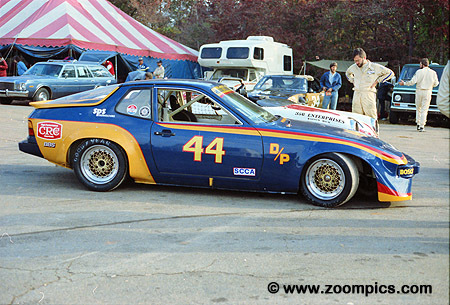 Doc Bundy driving the Holbert Porsche 924 won the 1980 D Production Championship. In 1981, he qualified on the pole and led the first 8-laps. A problem with the windshield wiper - combined with rain and a muddy track impaired Bundy's vision which allowed Tom Brennen to take the lead and the 1981 National Championship. Despite the adverse conditions Bundy's track knowledge allowed him to finish second. Bill Coykendall in the No. 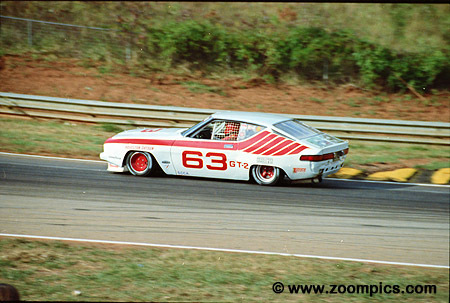 63 Datsun 200SX started first in the GT2 race. He led laps one through six before his rain tires lost grip on a drying track. Dave Frellsen in a Datsun 510 took the lead and had the field covered until his head gasket blew. This allowed Rob Dyson to inherit the lead. He managed his tires for the final 6-laps and won the GT2 National Championship. Tom Davey won the 1980 and 1981 GT3 National Championship in the No. 31 Volkswagen Scirocco. His 1981 title was much harder to secure. Davey qualified on the pole but made a bad start which allowed Tom Jones also in a Scirocco to take the lead. In challenging conditions, Davey chased down Jones and passed him on the last lap. 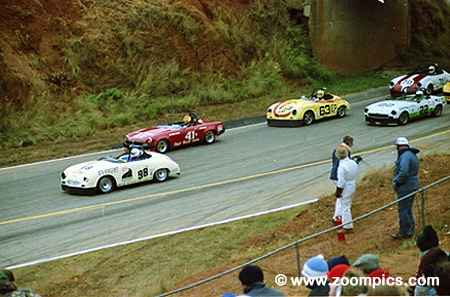 A quality field of cars and drivers participated in the 1981 C Production National Championship in a Triumph TR8. Ken Slagle in a Triumph TR8 qualified on the pole and captured the championship. 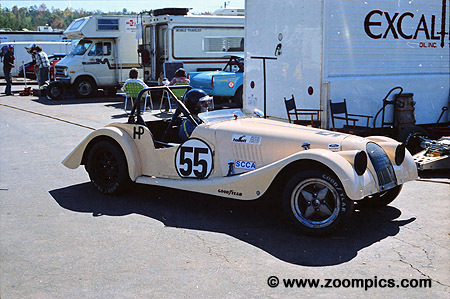 It was his second national title - his first was in 1975 driving an F Production Triumph Spitfire. 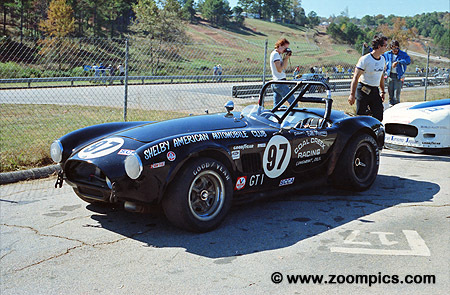 Bill Murray finished eleventh in GT1 driving this Cobra. In 1982, Murray entered the Runoffs with a white Cobra - not the same car. Apparently, No. 97 had been raced at Le Mans was too valuable to be competing at the club level. John Bonvouloir avoids Linda Atwell to finish sixth in Showroom Stock C. The class was filled with controversy. The Fiat X 1/9s were required to race without their Targa tops and windows (driver & passenger) down. X 1/9 drivers put their windows up covering them with reflective tape and calling them mirrors. This strategy resulted in disqualification. The No. 18 Volvo P1800E of Gary Small was the fastest qualifier in F Production. He led the first 13-laps until he developed brake problems. The battle was then between Larry Moulton in the No. 77 Turner and fifth place qualifier Chris Crisenbery. Late in the race Moulton was blocked by a back-marker and could not make a final charge on Crisenbery. 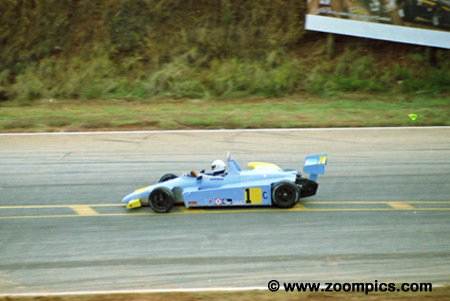 Formula Continental was won by Jim Hickman driving a Ralt RT-5. During the race, Hickman turned a lap .7-seconds quicker than his qualifying time and beat the established fastest race lap by 3-seconds. 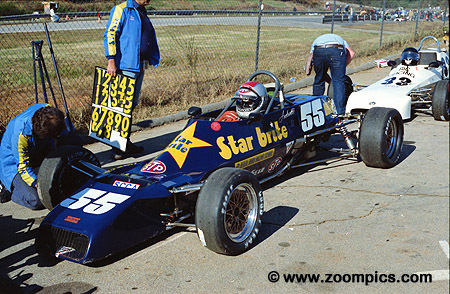 In 1982, Hickman entered and finished seventh in the Indianapolis 500 which earned him the Indy 500 Rookie of the Year title. Unfortunately, he died later that year in a practice accident at the Milwaukee Mile. Bill Noble's Caracal received a lot of attention. 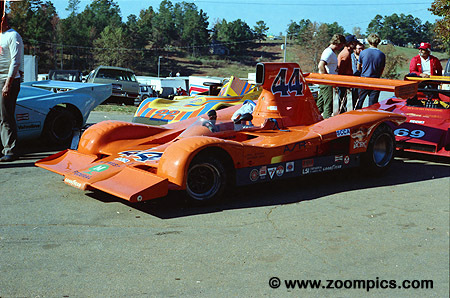 The aerodynamic design was ideal for Road Atlanta's long back straight. However, a protest was filed which resulted in the car's side pods being removed. The car proved very competitive but Noble retired when rain during the race caused the lexan to fog and impair his vision. The Formula Ford race was red flagged after 4-laps. This was caused by a multi-car accident at the bridge. 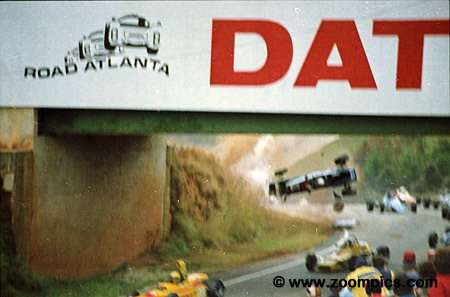 In the air is the Lola T-540 of John Hilton. The race was restarted and Dave Weitzenhof beat Dennis Firestone to the flag. This was Weitzenhof's third Formula Ford title in five-years. Runoffs competitor Jeff Miller entered the C and D Sports Racing classes. 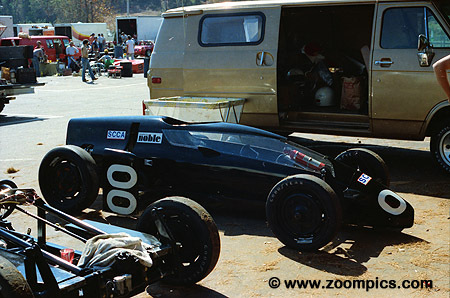 Miller driving a Lola T-496 raced with eventual C Sports Racing winner, Tom Foster. Unfortunately, Miller was eliminated when he crashed in turn-5. He had better luck in D Sports Racing claiming his fourth National Championship with a flag-to-flag victory over Alex Miller. 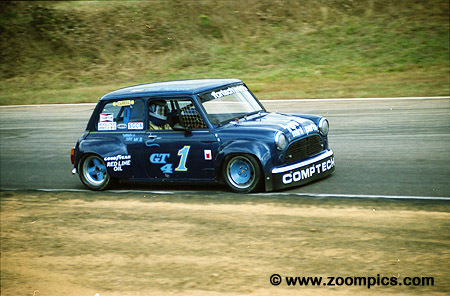 As expected, the Fortech Mini Cooper S driven by Doug Peterson was very competitive. Peterson qualified on the pole and led the race until lap-5 when he broke an axle. Jim Dentici in Honda Civic inherited the lead and won the GT4 National Championship. No. 41 Mike Pinney put his MGB on the E Production pole. But it was second place qualifier John O'Steen in a Porsche 356 that won the National Championship. Joe Cogbill in the No. 63 Porsche finished second with Pinney rounding out the podium.